The board was originally designed by Colonel W H Richards, who taught military surveying at the Royal Military Academy Sandhurst in about 1880 before he went on to teach in India. The board was improved by Major (later Colonel) William Willoughby Cole Verner who had briefly Professor of Topography at the Sandhurst. 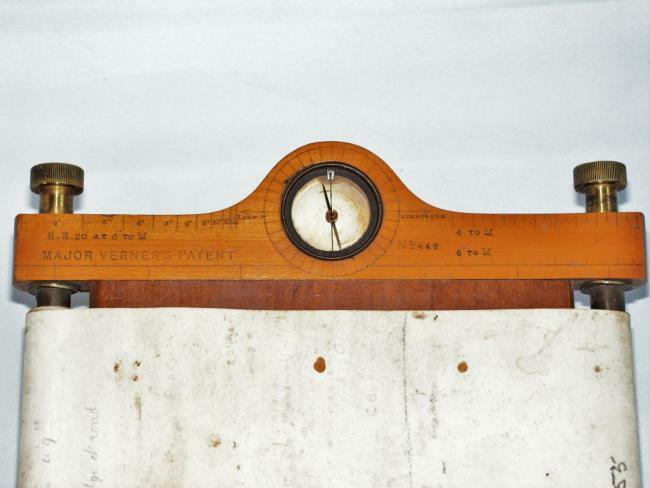 He patented improvements in 1887 and 1891 and the board became known as Verner?s. Verner published his own guide to the sketching board in 1889. However the board was not universally loved and some referred to it as ?The damnable cavalry sketching board?. The board normaly has an integrated clinometer and compass. On the board is written "Major Verners Patent". The artistic sketching ability of the Military in the late Victorian and WWI period was a key to their effectiveness as cameras had not really come into play.? The board could be strapped on a forearm. It was used by the Cavalry and the RFC. It's 24 cm high and 17,5 cm wide. This one still holds the original notes. 1st. Turn the horse exactly in the direction of the object. 2nd. Revolve the board on the wrist until the meridian line corresponds with the [compass] needle? 3rd. By moving the arm to the right or left, bring the point from which the line is to be drawn on the sketch opposite the centre of the body. Now turn the ruler in the required direction, its edge corresponding with the point and draw the line? After a little practice the whole operation may be accomplished in about 15 seconds,correct within 2 degrees. A horse will generally stand still long enough to permit the direction to be drawn? Horses soon learn that they are meant to stand steady for a few seconds? but being generally fidgetty in company, they will do best when alone...? The scale was calculated by counting horse?s paces. There is no doubt that practice was required: it is not surprising that the ?damnable cavalry sketching board? was not universally popular, yet it continued in use until the early 1930s with various modifications by different manufacturers. 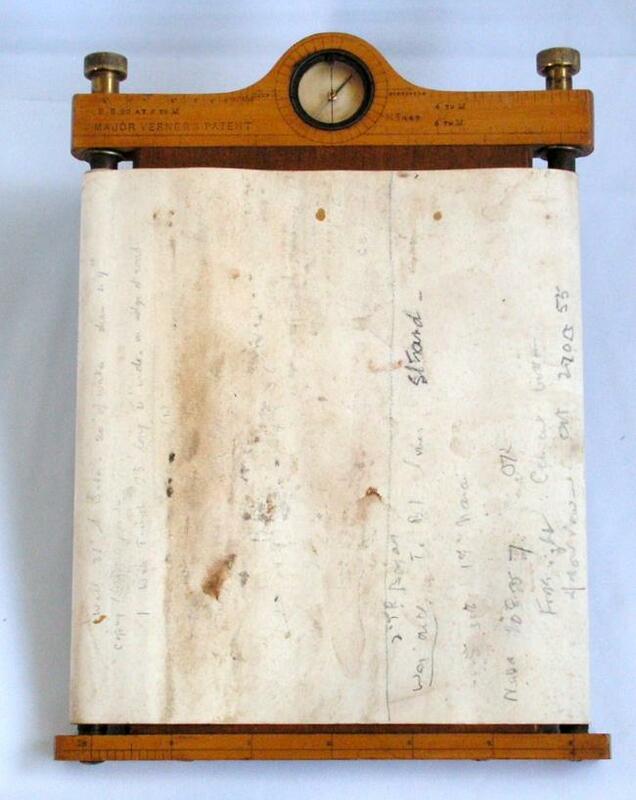 In World War I the sketching board appears to have found a new use. In his recent publication Mapping the world Ralph Ehrenberg, formerly of the Library of Congress, illustrates an almost identical instrument. Described as a ?flying map with chart-holder? 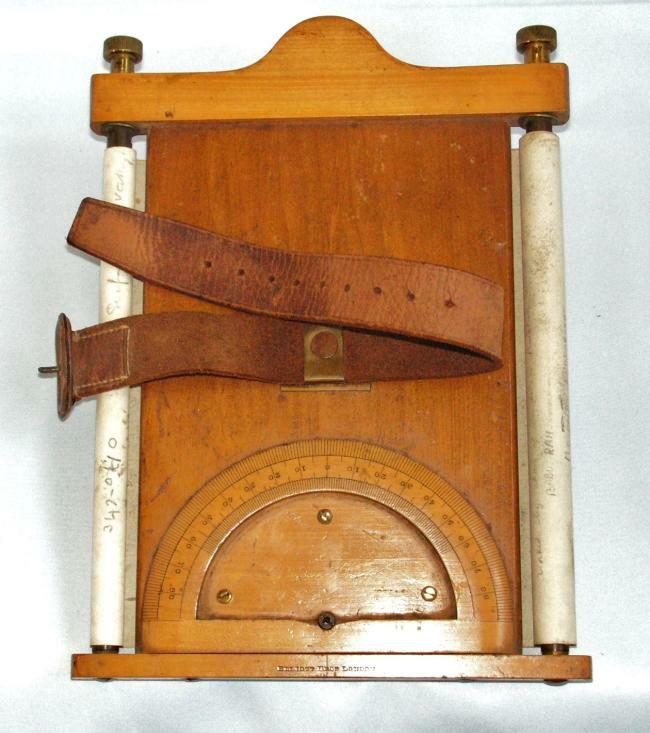 it was used by early solo aviators to strap air charts to their arm or leg for navigation. Charts were specially mounted in strips to fit the rollers. 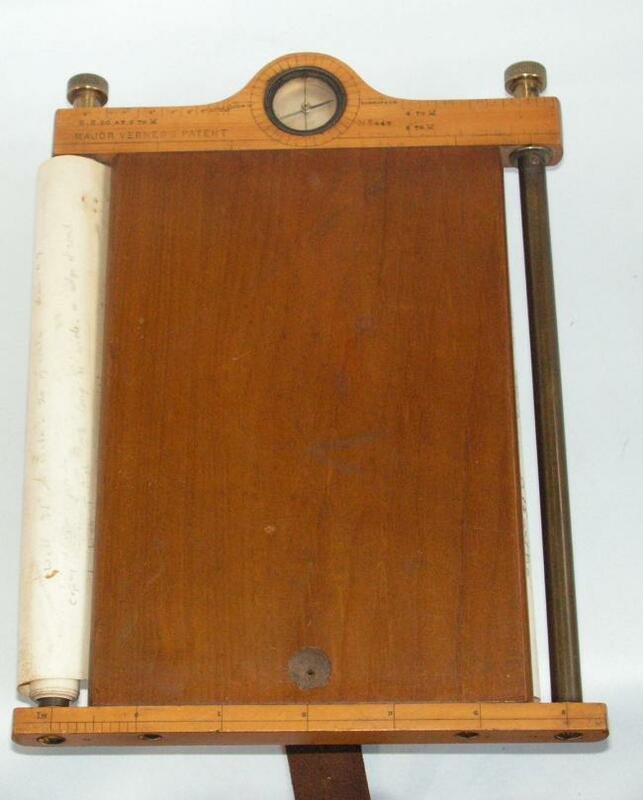 The main difference between the sketching board and the chart holder is that the ruler has been removed. It seems likely that the first aviators, some of whom started their careers in the cavalry, adapted the sketching board for this new purpose.